The client’s brief for this pool was something that incorporated entertainment and family fun while maintaining a strong aesthetic appeal. The infinity pool was designed by John Rast Building Design in conjunction with the design of the house, with the final pool finishes proposed by Exotic Pools. The pool’s location at the front entrance of the house, which is set on the side of a hill, provides an ideal setting for the pool, allowing easy access and a magnificent view of the property. 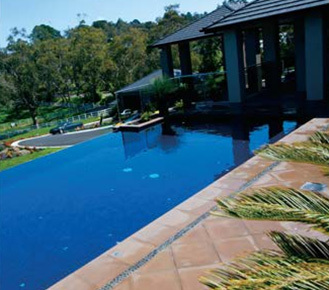 A 12 metre long swimout ledge along the side of the infinity pool allows the owners to enjoy the country view while relaxing in the pool. Cascading water flows over the Eldorado stack stone feature spill wall into a lower trough to create an impressive vista one will never want to turn away from. 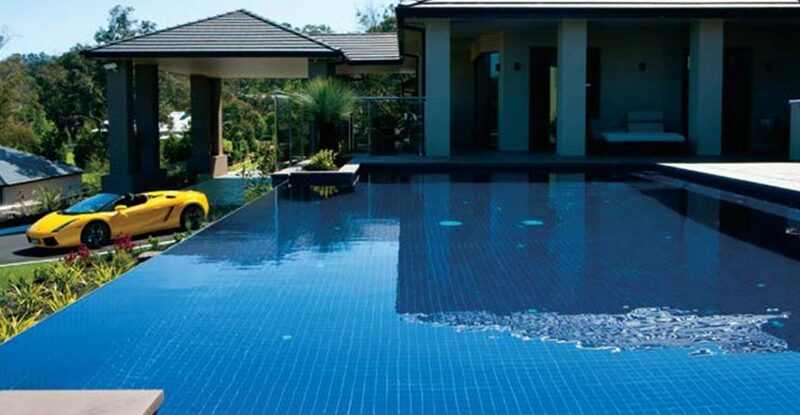 Glass fencing ensures this dark blue mosaic tiled showpiece can be viewed from all angles. The interesting design layout is also enhanced by the eight metre long negative edge wall and two garden beds on each side of the infinity pool. The pool fits in seamlessly with its surrounds with the use of coping and paving that matches the house’s rendered finish. Cascading water flows over the Eldorado stack stone feature spill wall into a lower trough to create an impressive vista one will never want to turn away from. Glass fencing ensures this dark blue mosaic tiled showpiece can be viewed from all angles. The interesting design layout is also enhanced by the eight metre long negative edge wall and two garden beds on each side of the pool. The pool fits in seamlessly with its surrounds with the use of coping and paving that matches the house’s rendered finish. Maintaining the pool will never have to enter the owner’s mind with the installation of a Waterco Micron sand filter, Waterco Hydrostorm filter pump, Quickclean Infloor cleaning system and an automatic water filling device. For sanitation, a Chemigem automatic chlorine and pH monitor feeding system was installed. 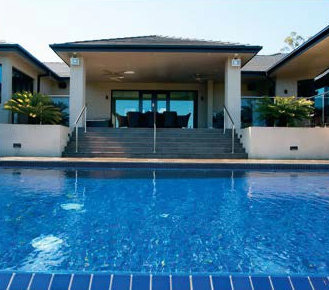 Since 1995, Exotic Pools has offered first class service in pool construction. Their experience in design and construction of innovative pools, which are individually designed to suit any lifestyle, is second to none. Their reputation is built on high quality workmanship, fair pricing, attention to detail and reliable after-sale service.